Each spring Colgate University celebrates, endorses, and advances the entrepreneurial spirit of its students and alumni with a weekend-long event. Every year we are joined by real-world entrepreneurs who share their success stories and lessons learned, and evaluate the most promising ventures emerging from the TIA Incubator during a Shark Tank-like pitch competition. Join us for the 8th annual eWeekend! This year's event will be held on Saturday April 6th beginning at 11:00am in the Hall of Presidents. The demo day will feature TIA entrepreneurs showcasing their ventures as well as a panel discussion titled "Bringing Businesses to Life," moderated by Bob Gold ’80, and featuring an impressive panel of alumni entrepreneurs. The panel discussion will be followed by the Colgate version of Shark Tank, where four teams will pitch to the panel for cash prizes. This event is part of the Colgate Leadership Tradition at 200 Years series. Entrepreneur Weekend is the capstone to the Thought Into Action (TIA) Incubator, a yearlong commitment in which students develop an idea and make it go live with the help of alumni mentors. Students presented their TIA ventures in hopes of gaining further mentorship and financial support from the Colgate network. These ventures included for-profit, not-for-profit, and campus/community initiatives. That afternoon, during the panel discussion “Liberal Arts and Entrepreneurship,” panelists shared their experiences in entrepreneurship, highlighting the importance of establishing a good plan, being coachable, and working through failures. Panelists included: Bob Gold ’80, CEO and president of Ridgewood Capital; Jon Klein, co-founder of TAPP Media and former president at CNN/US; Jeffrey Sharp ’89, academy award winning filmmaker and president/CEO of Sharp Independent Pictures; and Katie Finnegan ’05, principal and founder at Store No. 8 and vice president at Incubation Walmart. Finnegan was also awarded the Alumni Council’s Entrepreneur of the Year Award. Alumni panelists highlighted the ways their Colgate education allowed them to be successful entrepreneurs. Students then had the opportunity to pitch their ventures during a Shark Tank­–style competition for funding and other support from the panelists. ISO Film, a creative content house that specializes in film and video production founded by Lauren Sanderson ’18 and Brandon Doby ’18, earned $1,000 and was given a chance to make a film with Academy Award-winning producer Sharp. Loophole — a rubber ring phone grip and kickstand — and its founder Patrick Crowe ’18 earned $1,000; also, Gold and Finnegan placed orders for more than 2,000 units of branded products. Gipper, an automated athletics communications service for high schools and colleges, earned $3,000, and Finnegan offered San Francisco office space to its founders Matthew Glick ’19, Jack Zamore ’20, Ruchit Shrestha ’20, and Abby Waxler ’19. UCan, a social recycling system for colleges and universities that channels generated funds toward local anti-poverty organizations, earned $4,000 to expand its operations. Finnegan offered to connect UCan’s founder Christina Weiler ’21 with Walmart’s operations team to expand the project in Walmart retail stores. Colgate’s leadership in liberal arts entrepreneurship was powerfully represented by the Thought Into Action student entrepreneurs who continue to illustrate the strong connection between liberal arts and entrepreneurship. Over the past nine years, more than 500 Colgate entrepreneurs have gone through the TIA Incubator and launched their ventures, guided by more than 140 alumni, parent, and community mentors. Founder and CCO, The Honest Co.
To support opportunities and experiences facilitated by Thought Into Action please contribute to the Thought Into Action Fund. All support will be administered according to the guidelines of the fund. Questions about Entrepreneur Weekend? Contact the Office of Special Events for Institutional Advancement at 315-228-7782 or cuspecialevents3@colgate.edu. 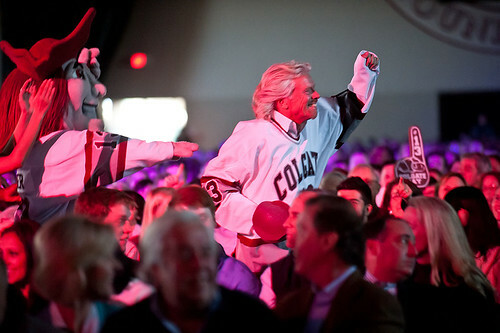 Learn more about Colgate's Thought into Action Colgate Entrepreneurs.